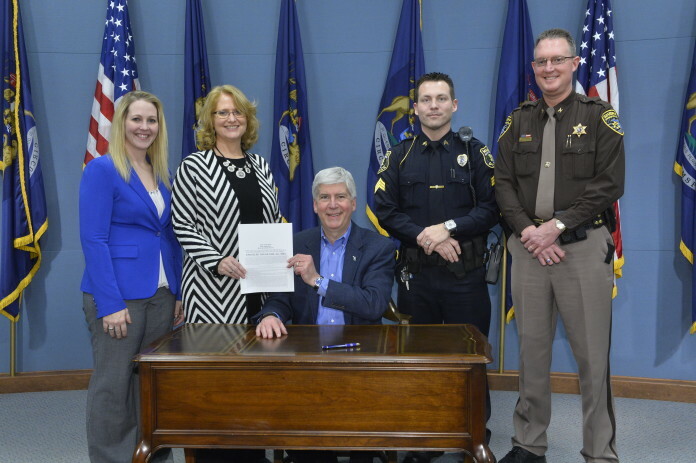 LANSING – Improving the trust and cooperation between the public and members of law enforcement is the goal of a new executive directive signed today by Governor Rick Snyder. Executive Directive 2016-2 tasks the Michigan Commission on Law Enforcement Standards to produce a public report addressing the topic of fostering public trust in law enforcement. MCOLES is responsible for promoting public safety in Michigan by setting standards for selection, employment, licensing, and funding in law enforcement and criminal justice, for the public and private sectors. Recommend additional improvements that can be considered by the state Legislature. MCOLES must complete its study and produce a report within 120 days. In addition to the Executive Directive, Snyder signed a 17-bill package updating requirements for law enforcement in Michigan and responsibilities related to the Michigan Commission on Law Enforcement Standards. Provides MCOLES access to controlled substance records in appropriate circumstances. SBs 95-96, sponsored by state Sen. Margaret O’Brien; SBs 866-867, sponsored by Schuitmaker; SBs 868-869, sponsored by state Sen. Rick Jones; House Bill 5494, sponsored by state Rep. Vanessa Guerra; HB 5495, sponsored by state Rep. Stephanie Chang; HB 5496, sponsored by state Rep. Peter Lucido; HBs 5497-5498, sponsored by state Rep. Klint Kesto; HB 5499, sponsored by Rep. Triston Cole; HB 5500, sponsored by Rep. Jim Tedder; and HB 5501, sponsored by state Rep. Kathy Crawford all update areas of state law to reflect changes made in SBs 92-94. The bills are now Public Acts 289-305 of 2016. For more information on this and other legislation visit legislature.mi.gov. allow guest posting on your blog ? I can write hi quality posts for you.